TURKEY: INSULTING THE SULTAN LEADS TO NEWSPAPER EDITOR’S ARREST……. – The Tundra Tabloids……. 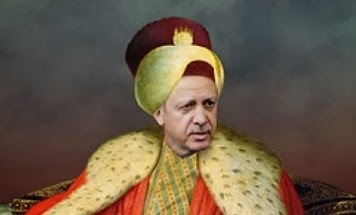 TURKEY: INSULTING THE SULTAN LEADS TO NEWSPAPER EDITOR’S ARREST……. This is supposed to be the Islamic world’s prize example of modernity in the muslim world? We all know better though, Muslims could never produce modernity and remain sharia compliant muslims. Turkish police on Friday detained the editor of a leading English-language daily newspaper on suspicion of “insulting” President Recep Tayyip Erdogan in a series of tweets. Today’s Zaman editor-in-chief Bulent Kenes was detained at the newspaper’s offices by plainclothes police who raided the building late in the evening and took him away in a car, the daily said. Samanyolu, a television channel close to the newspaper aired live coverage of his departure in police custody. Hundreds of staff members could be seen crowding round Kenes in solidarity as the police took him away to Istanbul’s main Caglayan courthouse. Clutching placards reading “free media will not be silenced!” Kenes’ supporters had also stood around him during the dramatic scenes inside the newspaper’s offices as he awaited his detention. Previous Post Previous Post TURKEY: BLAST IN ANKARA KILLS 20 AHEAD OF PRO-KURD PEACE MARCH……. Next Post Next Post ISRAEL: DEATH TOLL RISES AS ISLAMNAZIS GO FULL JIHAD…….